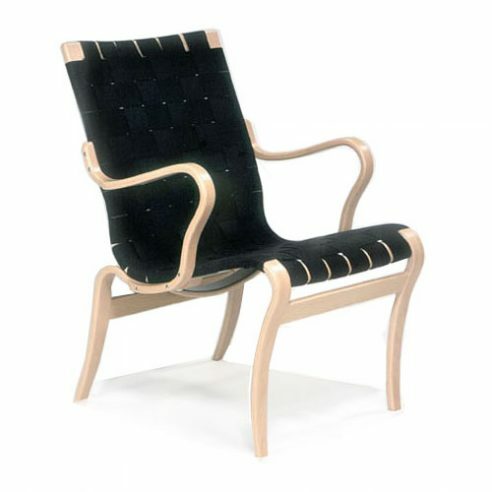 Bruno Mathsson had introduced his three basic chair models, easy, working and lounge chair Model 36, in the late 1930’s but had not finalised his thoughts on aesthetics and construction details on all three variants to his satisfaction. It was to take almost ten years for Mathsson to resolve matters. As early as 1942 designed a variation of the easy chair called Model, 42 in which he combined the seat, back and front legs to form a single curved frame of laminated wood. The idea was dropped as the glue was not strong enough to hold the structure. target="_blank">Miranda and the work chair named Mina. Both Mina and Miranda have a softer leading edge to the front of the seat to aid blood circulation. Mina can be upholstered in plaited webbing, sheepskin or fully upholstered in Tonus fabric or Elmosoft leather over polyether (CHMR) foam with a supporting web. When upholstered the fabric or leather is stitched horizontally with parallel seams. Mina is manufactured with both the seat frame and supporting under frame in laminated beech. Upholstery is in plaited hemp webbing, sheepskin or fully upholstered in Tonus fabric or Elmosoft leather over polyether (CHMR) foam with a supporting web. When upholstered the fabric or leather ispadded and stitched to create a dimpled effect.